It is common knowledge that persistence and perseverance are important ingredients for success in almost any field. Whether we seek it in our careers or personal interests, stick-to-itiveness is one of the key factors that make or break our advances. 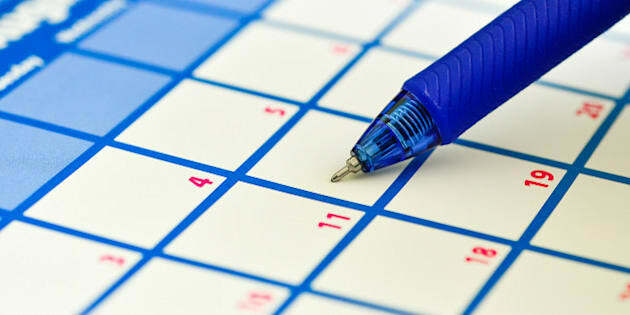 Close-up of an office calendar and a pen. Even the most accomplished people share this. In addition to their talents, they develop and maintain routines they rarely deviate from, allowing them to keep building on their achievements. In his informative as well as highly entertaining book, Daily Rituals: How Artists Work, the author Mason Currey describes how structure and discipline have formed the work and lifestyle habits of dozens of famous writers, painters, composers and musicians. The rules and parameters they set for themselves not only helped them with their tasks at hand but also let them overcome obstacles and adversities. Of course, not only the gifted few but all of us depend on schedules, programs and routines, if we want to get anything done. Although these devices may connote repetitiveness, automation, even monotony, they are in many ways the very foundation on which the extraordinary can unfold. Yes, Currey admits, "to follow a routine is to be on autopilot. But one's daily routine is also a choice, or a whole series of choices. In the right hands, it can be a finely calibrated mechanism for taking advantage of a range of limited resources: time (the most limited resource of all) as well as willpower [and] self-discipline." The choices we make throughout the day may feel like they are based on well-considered decision making, but they are not, according to Charles Duhigg, the author of The Power of Habit: Why We Do What We Do In Life and Business -- they are mostly habits themselves. In fact, he claims, almost half of the actions we take are not based on conscious decisions at all. So it is those habits that we need to focus on and change or fine-tune if necessary. But this is not always an easy task. Many of us have only a vague idea of what we want or which direction our life should take. Generally speaking, we all want to be happy, do meaningful work, have rewarding experiences, be in loving relationships, enjoy good health, and so on. We may be aware if something goes wrong or could be improved upon. We may even see a solution right in front of us. And yet, making the extra effort and bringing about a positive change may still seem out of reach. Why? What happens when good intentions fail is that they are not sufficiently anchored in people's reality, their daily form of existence, says Dieter Frey, a professor for psychology at the Ludwig Maximilian University in Munich, Germany. Someone may want to make more money, find a better job, lose weight or gain greater fitness, but it won't happen if there is no infrastructure in place to facilitate the necessary steps towards such goals. A framework must first be built where individual actions can turn into patterns, and patterns become habits, thereby supporting and promoting the whole process, which eventually can lead to the desired outcomes. All objectives have to be aligned with the existing conditions; they have to be realistic, and progress has to be measurable, says Frey. Obstacles and hindrances will continuously arise, but they become more manageable when they are faced with an arsenal of well-honed countermeasures. And those can only be obtained with practice. Obviously, no pursuit, no matter how well designed, is ultimately guaranteed success. But the odds tend to improve in favour of those who patiently persist in their efforts.